If you have a Machine Fusion Monster(s) in your GY, your opponent cannot target this card with card effects, also it cannot be destroyed by your opponent’s card effects. If this Fusion Summoned card you control is sent to your GY by an opponent’s card: You can Special Summon 1 “Cyber Dragon” from your hand, Deck, or GY. You can banish this card from your GY; this turn, your opponent cannot target Fusion Monsters you control with card effects, also they cannot be destroyed by your opponent’s card effects. Cyber Eternity Dragon is another new member of the “Cyber” archetype. Another Extra Deck option for Cyber Dragon players, needing the typical “Cyber Dragon monster as part of the requirements. Two other Machine monsters is easily done, so no problem there. Cyber Eternity wants to be brought out after you have another Machine Fusion in your grave. The protection it gets when there is a Machine Fusion in your grave is fantastic. While Fusion Summoned, Cyber Entity will replace itself with a Cyber Dragon monster from hand, deck, or grave when sent to the grave by your opponent. The added benefit of searching out a Cyber Dragon from the deck to Special Summon thins the deck and gives you access to many targets. Finally, Cyber Entity’s ability to banish itself from the grave to give any Fusion Monsters you control the same protection it got from having a Fusion Machine monster in the grave is a great full-circle style effect. It gets protection from a Fusion Machine monster being in the grave, then lends that same protection for the turn it banishes itself. Chain it to any of your opponents effects to save your Fusion monsters. It can happen the turn it goes to the grave, it can cover several Fusion monsters which is good since Cyber Dragons have MANY fusion options. Great effects, pretty good stats, ton of support, another worthy addition to the archetype. To begin week 2 of Legendary Duelists month is the Boss Monster for Cyber Dragons (sorry they didn’t get reviewed last week, the next three weeks will have at least one new Cyber Dragon card, every archetype will probably get 3 new cards reviewed in this month excluding one getting 4), and that new boss is the Fusion monster Cyber Eternity Dragon. Cyber Eternity Dragon is a Level 10 LIGHT Machine Fusion with 2800 ATK and 4000 DEF and requires 1 Cyber Dragon monster and 2 Machine monsters as material. ATK is ok but low on a Level 10, but 4000 DEF makes up for it and makes me think this is a defensive version of Cyber End Dragon, summoning requirements are easy in Cyber Dragons since all of them are Machine and of course Cyber Dragons, and LIGHT and Machine make for a good combination. If you have a Machine Fusion Monster(s) in your GY, this card cannot be targeted or destroyed by card effects of your opponent. Nice to have protection, but downside is that you need a Machine Fusion in the GY. You could probably use Instant Fusion to get something like Panzer Dragon or Chimeratech Rampage Dragon to use it and a Cyber Dragon for Sieger, so it isn’t that bad getting a Machine Fusion in the GY. If this Fusion Summoned monster you control is sent to your GY by an opponent’s card, you can Special Summon 1 Cyber Dragon from your hand, deck, or GY. 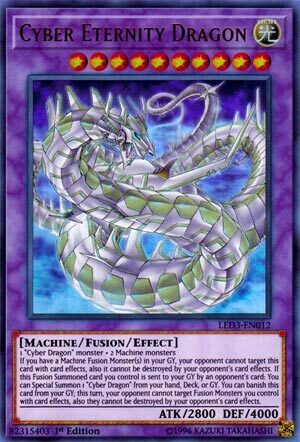 Would of liked if this got a Cyber Dragon Fusion out of the Extra Deck instead like Cyber Twin Dragon or Cyber End Dragon, but at least it replaces itself and it can revive Sieger since it is Cyber Dragon in the GY. You can banish this card from the GY to prevent your opponent from targeting or destroying your Fusion Monsters with card effects for the rest of this turn, which is nice if you can use this for a Cyber Twin or Cyber End Dragon or maybe Chimeratech Rampage Dragon. Eternity Dragon is 100% meant to be a Defensive opposite to the Offensive powerhouse of Cyber End Dragon, but I would of liked a Cyber End retrain that had the piercing and 4000 ATK and some more amazing effects, but Eternity is a nice piece for more Fusion-centric versions of Cyber Dragons. Art: 5/5 He looks endless and majestic, love it! Week 2 in this set opens with Cyber Eternity Dragon. Level 10, Light, Machine, with attack and defense opposite of Cyber End Dragon, at 2800-4000 respectively, and Fused with Cyber Dragon and 2 other generic Machine Monsters. So, our Eternal friend can’t be targeted by card effects if you have at least one Machine Fusion Monster in your Graveyard. This is good, protection, even specifically so, is welcome. Eternity Dragon is also further protected from destruction by your opponent’s card effects under the same requirement, making this a relatively difficult card to get off the Field. The 2800 attack is certainly strong, and the 4000 defense is going to stand up to just about anything (especially commonly played cards). You get to Special Summon a Cyber Dragon from your Hand, Deck, OR Graveyard if this card leaves the Field via your opponent’s card. So all of a sudden all that protection and the high attack and defense start to work against Eternity Dragon, but it’s still doable to get this effect. Finally, by removing this card from play, any Fusion Monsters you control for said turn gain the protection this card originally had from card effects and being destroyed by those of your opponent. This card is obviously more defensive minded than a lot of the Machine/Cyber/Chimeratech Fusions, but that’s welcome too. Still a solid enough card. Art: 4/5 All Cyber Dragon art is legally distinctly different enough from Onyx/Steelix to keep the Pokemon lawyers at bay.